This Web Based Training addresses the needs of engineers who need to get familiar with advanced developments in the field of HSPA+/eHSPA. 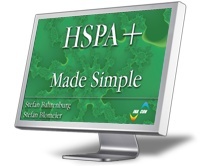 In the beginning of the Web Based Training HSDPA and HSUPA are compared to HSPA+. The Web Based Training continues with the elaboration of background and implementation of important release 7 key technologies like MIMO, higher order modulation schemes (4-PAM, 16-QAM, and 64-QAM), Continuous Packet Connectivity (CPC), layer 2 improvements, and RRC state operation enhancements. The next part looks into release 8 HSPA+ and works on features like 64-QAM together with MIMO and DL IC. The final chapter is dedicated to selected important scenarios of HSPA+ RRC state operation enhancements. What are the differences in-between HSPA and HSPA+? How do higher level modulation schemes impact the mobile radio network’s performance? What is MIMO and what makes it that important for tomorrow’s mobile radio standards? How MIMO is introduced in HSPA+ and what needs to be changed in terms of signaling and protocols? What is Continuous Packet Connectivity and what needs to be done in order to efficiently implement it in HSPA+? How does the new generation of L1 signaling look like in HSPA+? How do MAC, RLC, and RCC protocols change for HSPA+? When and how MIMO can be combined with 64-QAM? How can DL interference cancellation be implemented in the UE? What other advanced receiver technologies are standardized for HSPA? If you interested in our Web Based Trainings, please contact us. We would be pleased to inform you.